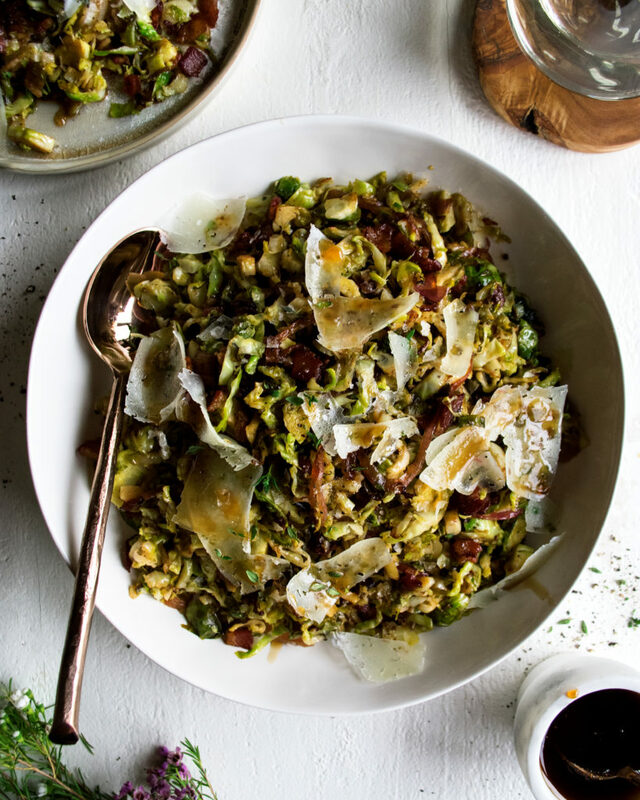 Brussels sprouts have become a staple on every holiday table, so why not make them the very best they can be!? 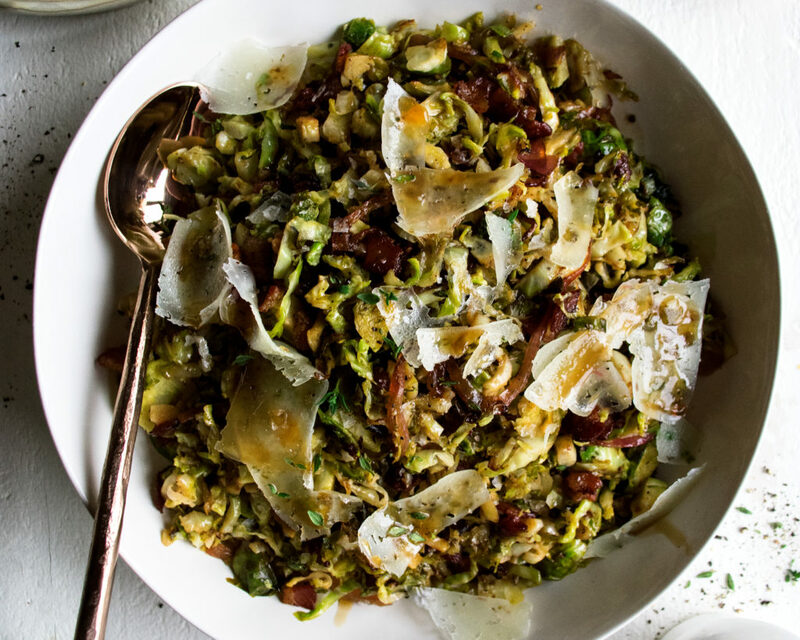 Enter this warm brussels sprout salad with cider syrup. It’s the perfect counterpart to all the heavier Thanksgiving side dishes…and it is absolutely delicious. 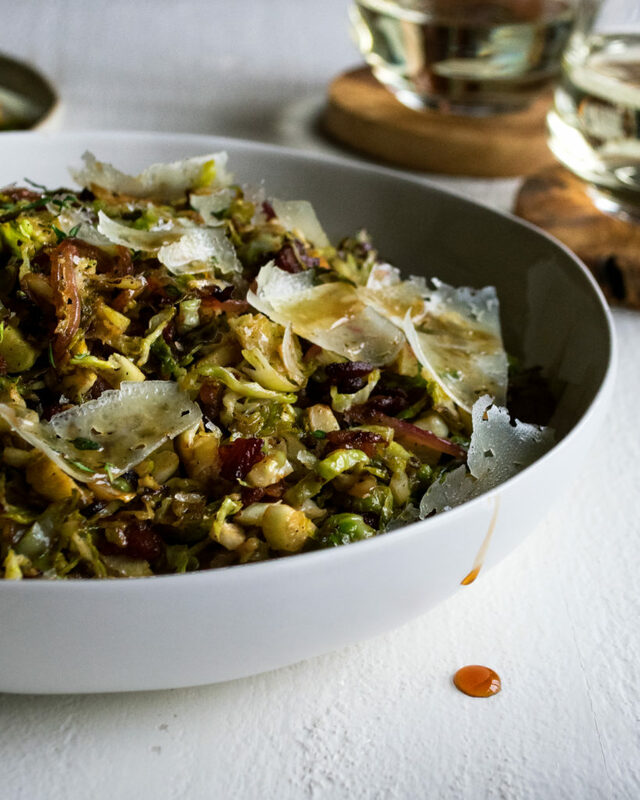 To make a brussels sprout dish really, really good, you need something rich, something sweet, and something acidic. 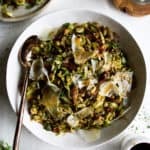 It’s the blend and balance of these flavors that pulls everything together and takes a rather bitter, boring vegetable into something bursting with flavor. Bacon is always a great go-to ingredient and for good reason. The rich, flavorful salty bite is the PERFECT base for an earthy vegetable. I render lots of bacon down and use all of the drippings to saute the brussels sprouts. A really important tip is to saute large amounts of vegetables in two to three batches, especially if you’re not working with the biggest pan or skillet. Cooking them little by little allows them to caramelize better. Then, I like to combine everything back together before adding the flavors. A splash of vinegar and lemon juice bring the acidic component to the salad. You really need just a bit of brightness to make it all pop. I add sharp manchego cheese and nutty, roasted hazelnuts on top. And then with the cider syrup drizzled over it all…it is truly such a wonderful warm holiday salad. Also note that I’ve shaved the brussels sprouts really thin before sauteing them. This helps trap all of the flavors, and I think it’s truly the best way to eat them! I can’t wait to make this again for Thanksgiving (which is just a week away! ), and I hope you do, too. Maybe alongside this roasted acorn squash… Enjoy! 1. Combine the apple cider and brown sugar in a small saucepan. Bring to a boil over medium-high heat. Boil the mixture for 2-3 minutes. 2. Reduce the heat to medium-low and simmer for about 30 minutes, or until thickened and syrupy. Turn the heat off and reserve for the salad. 1. Add the diced bacon to a large sauté pan or cast-iron skillet over medium-low heat. Allow the bacon to render until crisp, about 15-20 minutes. 2. Meanwhile, cut each brussels sprout in half. Place the flat side of each brussels spout onto the cutting board. Use your knife to thinly shave them by cutting each spout very thinly. 3. When the bacon is done, use a slotted spoon to transfer it to a plate lined with paper towels. Add enough olive oil the bacon fat left in the pan to generously coat the bottom. Heat over medium heat. Add the shallots. Sauté until tender and caramelized, just a few minutes. Transfer the shallots to a plate. 4. Add a little bit more olive oil to the pan. Once hot, add half of the brussels sprouts. Season with a pinch of salt and a few cracks of black pepper. Let them sauté just a few minutes until tender and caramelized, yet still hold some color and texture. 5. Transfer them to a plate and repeat with the remaining brussels sprouts. Once the second half are cooked, add the shallots and first half of sprouts back to the pan. 6. Raise the heat to medium high. Add the apple cider vinegar and lemon juice. Let bubble and cook for a few minutes. Taste the mixture and season with more salt and black pepper as needed. 7. Transfer the warm salad to a plate. Use a peeler to “shave” the manchego cheese over top. Garnish with the hazelnuts and fresh thyme leaves. Drizzle the cider syrup over top or serve it on the side.